Thursday the 18th we are playing at Trash bar in W’burg. Stereo Off is at 10pm. Its $7 to get in, and there is an open bar in the stage area from 8-9pm, so start Thursday right with some free booze at least. Trash is at 256 Grand St, Brooklyn, NY 11211 – just below Metropolitan avenue. Nearest trains: L Bedford Ave. / G Metropolitan Ave.
Or………. join us on the video side of things this time. 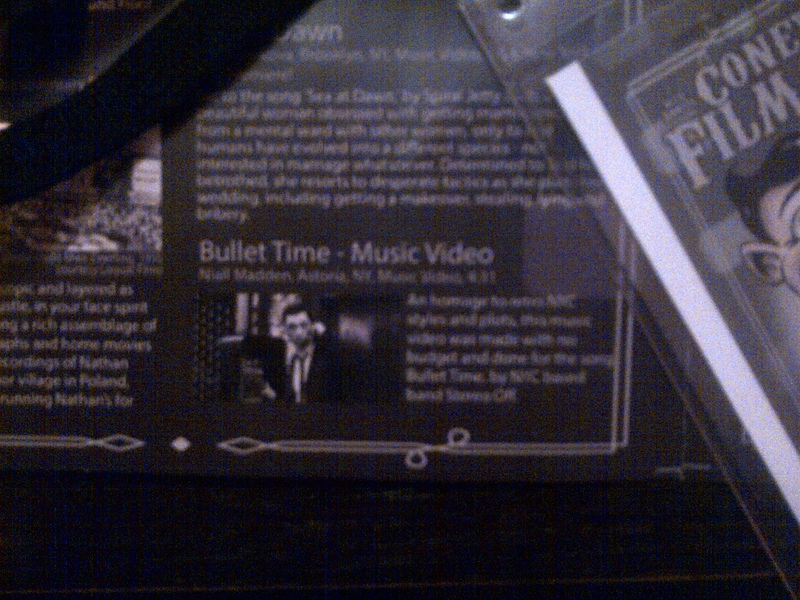 Our video for “Bullet time” made the Coney Island Film Festival. And it is being shown on Saturday the 20th between 7pm and 8pm. We are in program 7. Busy weekend for the band as we start finalizing the photo shoot takes from the previous weekend, in the meantime moving on to the music video shoots. The picture above is a hint. Its old school. Its black and white. So the weekend update had to wait a couple days as we were out and about, but another week, and some more coverage. Newswhistle put together an awesome piece and interview with the band at A Great White With A Blindfold: What Unsigned Brooklyn Band Is Sharpening Its Teeth. Citing a mix of 80’s bands and recent NYC bands of much hype. Quote: “this band is moving fast towards golden indie shores”. Nice one. You can also find 3 of the Non-EP tracks on that article too. And then moving back to the EP itself, a bonus review this week that nearly flew under my radar, from the Equal Ground. “the most eclectic electronic sounds with the most down to earth rock tones and crashes them together to create an enthralling experience” & “This is cool! Seriously cool!”. Thanks to both sites for the coverage, reviews and interviews. So not a bad weekend after all. Still plenty of work to do on the video though…. couple more sessions in the coming weeks, so stay tuned.